B. F. Skinner was an American psychologist. He was a behaviorist who studied the behavior from different perspectives, he made the theory of operant conditioning behavior and the consequence related to the reinforcements or punishments of the human beings or animals. Thus, he uses the scientific approach to psychology. However, in 1945 he became the chairperson of the psychology department at the Indiana University. In 1948, he starts teaching at Harvard and continues until his death. He wrote many books that focused on the behavior. He was best psychology writer; he focuses on the behaviorist principles, which was based on operant conditioning. He studied the process of “operating” on the environment, he said that there is a special kind of stimulus that impact on the organism, as the behavior of the living organism is followed by consequences. He modifies the organism’s tendency that through punishment, one may not repeat the behavior in the future. Through classical conditioning, he focuses on the behavior modification technique. He did the goals setting and made the program design, he did his research on the animal performing a behavior. He did the analysis on the positive and negative reinforcements by doing the experiments on the hungry rat. The punishment or the response from the person could weaken or eliminate the behavior as Skinner defined punishments as opposite of reinforcement (McLeod). Based on the principle of operant conditioning he did use of punishment and target the behavior. He said that that behavior could be shaped or creating behaviors through reinforcing are possible. While focused on the students, he said that behaviors could be modified, however punishing stimulus cannot stop the criminal behavior because they can be sophisticated and avoid the behavior for punishment. Behavior modification can be done and there could be desirable results of the behavior by reinforcement. Moreover, the behaviors cannot be modified due to the psychological problems example includes the addictions, neuroses, schizophrenia or autism etc. Freedom could be explained as the lack of resistance and punishment could be explained as the unwanted behavior. Thus, to get rid of the dangerous environment, punishment could be known as the important aspect in life, the societies are focuses on the human behaviors that whom should be given the reward and punishment because one attitude, a response could be changed or shaped as per demand. There is the impact of the reward and punishment on the physiological condition, as the stimulus could respond according to controlling aggression. If men are provided with freedom and dignity in the societies there can be the bad or worst situations occur, there are the better plans to make the society a place where there are no or fewer crimes (Skinner). In the societies, governments are making regulations based on the norms or chaos so that there could control the violence and the control aggression. People are engaging in the moral struggle so that societies could become the better places, the sexual behaviors and other criminal behaviors are affecting the societies and thus, rewards and punishments are there to control the risky, dangerous or the unethical behaviors. More reinforcing activities are implemented in the societies so that all control is exerted and the better designs could make for the alleviation of aversive features. In this way, it could be analyzed that human behavior could be changed through focuses on the theory of operant conditioning behavior. The moral struggle can make the world a better place, as human behavior is the result of consequence related to the reinforcements or punishments, the behaviorist principles can shape the people in the society by use of punishment and target the behavior. McLeod, Saul. 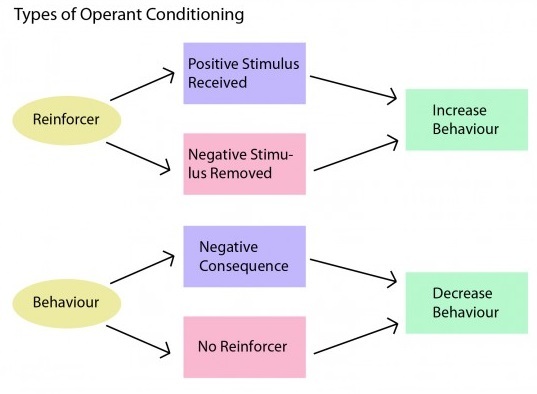 Skinner – Operant Conditioning. 2015. 2017 March 2015 <https://www.simplypsychology.org/operant-conditioning.html>. Psychologistanywhereanytime.com. Famous Psychologists: B.F. Skinner. 2005. 27 March 2017 <http://www.psychologistanywhereanytime.com/famous_psychologist_and_psychologists/psychologist_famous_b_f_skinner.htm>. Skinner, B. F. Beyond Freedom, and Dignity. A Pelican Book, 1971.